If you happen to be looking for a “sign of the times” that the world is changing right underneath your feet, then perhaps this story can help verify those deep in gut feelings that something bigger than you is unfolding. Let’s look at McDonald’s, for example, and the age of tradition of a Mickey D’s hamburger. It used to be, McDonald’s was so proud of the fact that billions of customers were served. And to us who drove by those golden arches would sit in amazement, just trying to imagine what a billion hamburgers served might actually look like. But fast forward from those days to today, and you’ll find the “Billions Served” text is no longer showing up on the signs. In fact, back in 1994, McDonald’s decided to stop updating their stores with the count because, according to McDonald’s, they had better things to do. 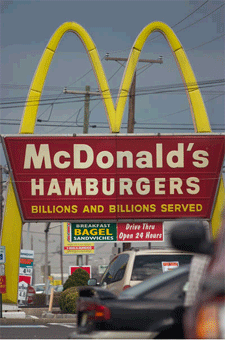 We were impressed, of course, that it took McDonald’s 46 years to reach 100 billion hamburgers served. But let’s take a look at something even more profound at work – let’s look at the growth curves of mobile web applications (iPhone apps and Android apps). Now we are talking about something that is truly out of this world, and something that has never seen before in any market, at any point in history. 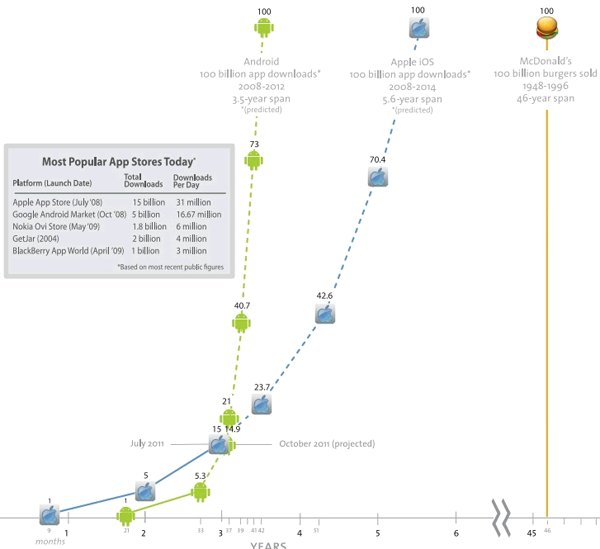 ZDNet.com put together an awesome PDF chart showing how long it took McDonald’s to reach 100 billion hamburgers served, and how long it’s estimated to take Apple and Android Market to reach 100 billion apps served. According to ZDNet, Mickey Ds took almost 26 years to reach 15 billion burgers sold, and about 46 years to hit 100 billion. That means Apple hit the 15 billion mark about 9x faster than McDonald’s. And based on projections, Apple could hit 100 billion withinfive and a half years, or about 9x faster than McDonalds. Now, Google lags Apple today. Its Android Market tallied 4.5 billion downloads in June, or after 33 months of operation. But based on projections of its accelerating growth, Google could hit 100 billion downloads even sooner than Apple. Here’s the infographic that ZDNet put together showing the comparative growth rates of McDonald’s compared to Android and iPhone app sales.